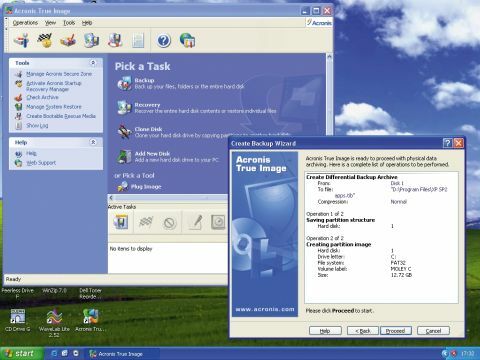 TrueImage started life as a disk imager, a program that makes a sector-by-sector copy of everything on a disk platter or in a given partition. It's gone far beyond that, though, and is now sold as the ultimate backup utility. It can still make full disk images, but it can also back up individual folders or files and place those backups on virtually any medium you wish. TrueImage 9 Home can copy files from one partition to another; onto a CD, a Firewire or USB drive; across a network; and now directly to a recordable or rewriteable DVD, via built-in burning software. This version of the program also adds differential backup to the incremental mode it has had for a while. The distinction between the two is clear when you have made a backup and are ready to update it. The incremental system looks at the initial full backup, and all of the incremental supplements made since then, and just backs up what has changed since the last increment. It gives the smallest, quickest backup, but you do need every increment in the chain for a full restore. Differential backup always works straight from the full backup file and backs up all changes from the original, even if they were backed up before. This way, you only need the full backup and the single differential for a full restore. The new SnapRestore function uses a Linux kernel to install enough of Windows to get you going very quickly - a matter of seconds - while it's still restoring the rest of an image. It sounds a bit dicey, but in practice it works pretty well. If you try and access part of the system that isn't yet restored, TrueImage handles it politely, and prioritises restoration of those parts of the system image. You can cordon off a section of your drive as a Secure Zone, where Windows can't get at it, and use this for your drive images. The program can also handle disk cloning for hard drive upgrades, a function that Acronis used to sell separately as MigrateEasy. You can even temporarily mount a drive image as a virtual drive, so you can work with the stored data.